Priorclave has launched its new front-loading cylindrical chamber autoclave, which is its largest yet and has been developed to allow labs to optimise efficiency from sterilisation in applications with high throughputs. The new Q63 – 500l front-loading steam steriliser features a lower loading height to assist lab staff with chamber loading/unloading, is castor mounted for ease of positioning, and is fitted with two non-tipping shelves and comes with a choice of optional items such as stainless steel baskets, waste containers and loading trolleys, all designed to enhance the efficiency of laboratory sterilising operations. Whilst offering increased loading, the combination of features such as forced air cooling to reduce cycle times and automatic timed free-steaming for improved air removal will add to the overall sterilising performance of the new Q63 autoclave. The build quality of the new autoclave designed and manufactures at Priorclave’s manufacturing centre in London uses epoxy coated panels and frame members treated with an anti-bacterial agent, which is highly effective against all bacteria and fungi including MRSA, key factors in preventing cross contamination within the laboratory. All operating settings are programmed easily through the Tactrol® 2 microprocessor controller which is standard across the entire Priorclave range. A feature of the new Q63/EH500 is that the control system can be configured to log all temperature, pressure time and cycle data into a single compact archive file which can be subsequently downloaded onto a USB flash drive for transfer to computer. The operational data then can be forwarded from anywhere in the world direct to Priorclave’s UK Service Centre for technical assistance in fine-tuning and clarification of autoclave performance if required. Priorclave, a household name within the global laboratory autoclave market, has developed and manufactures an impressive range of top and front loading steam sterilisers that include benchtop as well as front loading rectangular, power door and double-ended designs, laboratory autoclaves synonymous with quality, reliability and highly effective autoclaving processes. 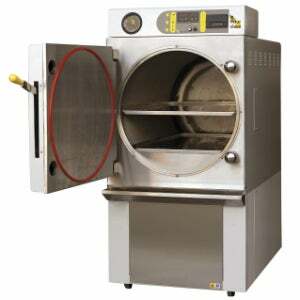 The addition of the Q63/EH500 with its 500l cylindrical-chamber capacity has extended the Priorclave standard autoclave range and is expected to become as popular as the Q63/320 model, and depending on operational requirements can be supplied for electrical or direct steam heating.